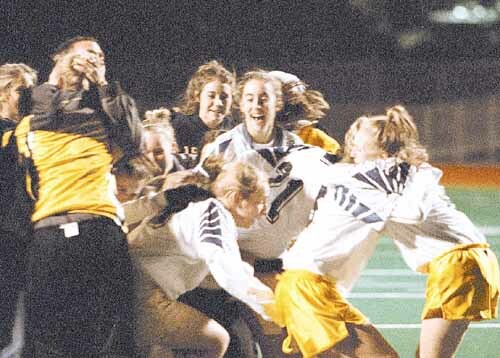 “Last year, we had seven teams in our league with three making the (WPIAL) playoffs. This year, we have six teams in our league and four make it. We’ve been finishing fourth in recent years. Perri enters his fifth year as coach of the Golden Tornado. Butler returns two productive forwards in junior Brittnie Spithaler and senior Hannah Hays. They combined for 21 goals a year ago. Rachel Woessner and Maddie Glew on defense, Kelly Kriley and Abby Boyle at midfield are some of the players the coach referred to. Butler recently surprised state-ranked Fox Chapel in a scrimmage. Elizabeth Simms (23), who scored Butler's only goal, heads the ball along during the Golden Tornado's 1-0 girls soccer victory Saturday over Villa Maria. 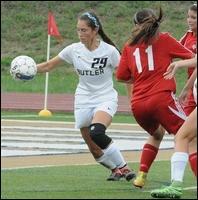 Butler followed that up with a 5-0 win Monday at Cardinal Wuerl North Catholic. Anna Voelker posted her second consecutive shutout and freshman McKenna Robinson scored a pair of goals. 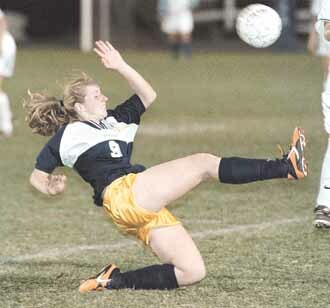 Britnie Spithaler scored a pair of goals to keep the Golden Tornado unbeaten. 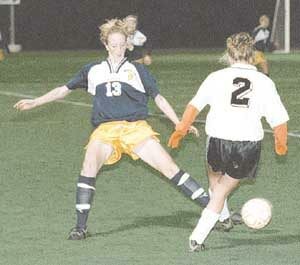 Odile Enslen and Liz Simms also scored for Butler (3-0). 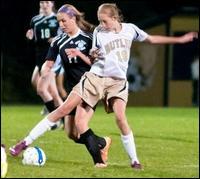 Alyssa Lapusnak scored three minutes into overtime to give Butler a 1-0 win over Shaler. in a 2-1 win over North Hills. 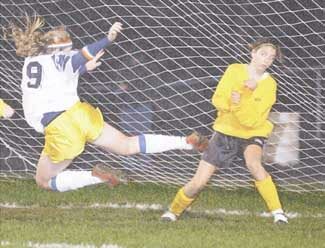 The Golden Tornado (3-4, 3-2) led 2-0 before North Hills scored a late goal. 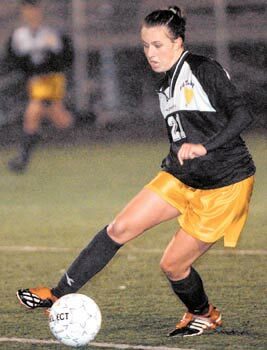 Brittnie Spithaler scored from 20 yards out five minutes into the second half to lead Butler past North Allegheny 2-1 on the road in a Section 2-AAA match. 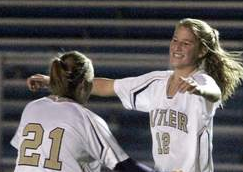 Haley Michael also scored for Butler (5-5, 5-3). 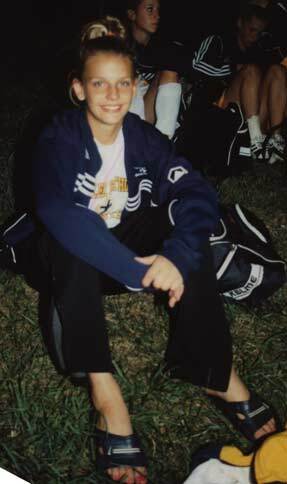 The Golden Tornado (4-2) received goals from Alexa Gray, Rachel Weyand and Rachel Pardo. Mackenzie Troyan earned the shutout. Goal Getters Booster meeting date November 20th at FSC 7:00 pm. 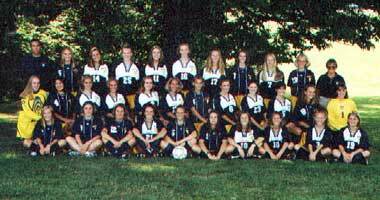 its first victory of the season with a 2-1 win over Kiski Area. Nikki Hladik had two goals, and Tia Maticic and Brittany Miller had one apiece to give the Tornado its first win. 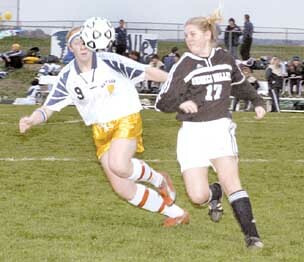 Nikki Hladik recorded two goals and one assist to pace Butler to a 5-0 win over visiting Knoch. Goalie Taylor Troyan picked up the shutout for Butler. 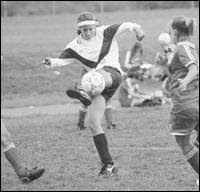 Chelsey Rock scored a goal off an assist from Tori Sawhney in the 78th minute as Butler edged North Hills 1-0 Monday. Goalie Taylor Troyan got the shutout, stopping four shots, for the Golden Tornado (4-7-1, 4-5-1). 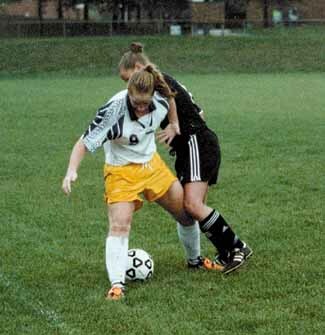 Nikki Hladik scored two goals and added two assists to help the Butler girls soccer team defeat Blackhawk, 6-3 . Chelsey Rock and Tina Maticic both scored twice in the win, while Mackenzie Hohn had two assists and Maticic one. 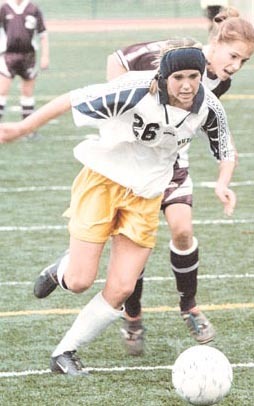 Taylor Troyan managed seven saves for the Golden Tornado (6-7-1). Chelsey Rock scored the game-winning goal in overtime as the Butler girls soccer team outlasted North Hills 2-1 in a Section 2-AAA game. Jaime Hildebrand assisted on Rock's goal while Brittney Miller's goal earlier in the game was assisted by Allison DeFurio. 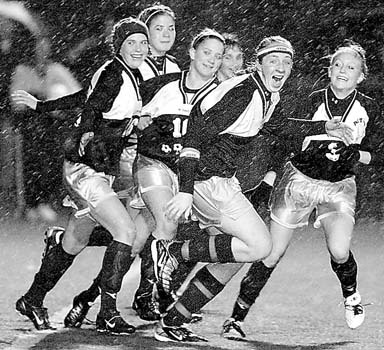 Chelsea Rock scored the only goal of the game for the Golden Tornado. 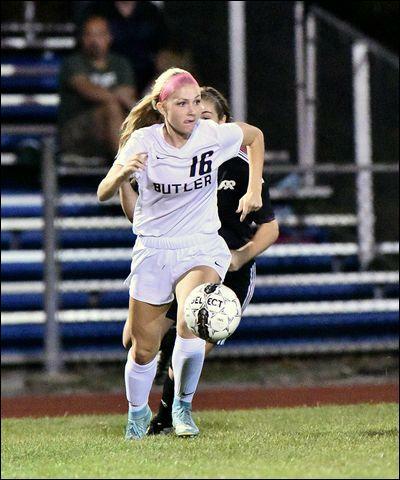 Butler girls shut out Shaler Jen Schwab and Rachel Cleary each scored a goal to lead the Butler girls soccer team to a 2-0 victory over Shaler Monday. Lisa Rodgers earned the shutout in net for the Tornado (8-6-2, 7-3-1). 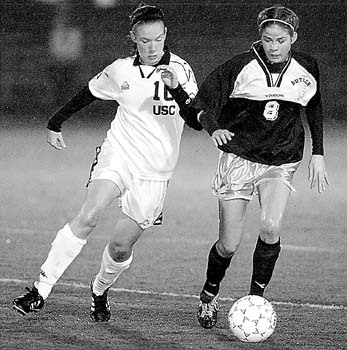 2007 Hermann Trophy candidate...best NCAA women's soccer player in the country. - Sophomore Annie Lowry scored two goals to lead Butler to a victory over Pine-Richland (11-6-3) in a WPIAL Class AAA high school girls soccer preliminary round game. 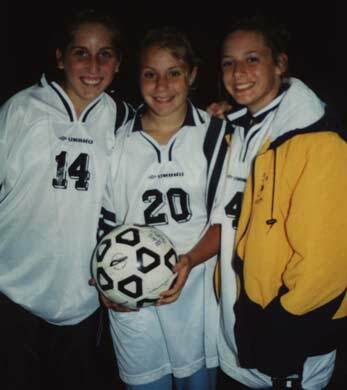 Butler (15-5-1), the 2000 WPIAL runner-up, will play at Gateway (17-1-2) on Monday Oct.22, 2001 8:00 in the first round.